Do IITs Produce only Billionaires? There you are, reading an article about the IITs again! 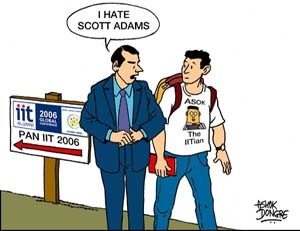 Everyone is talking about the IITs these days. So, you are also curious to read about the billionaire IITians. While you are here, do read about a little known side of the IIT life. IITs are also a great place to learn the art of Cartooning. Surprised? Look at me! If you are a regular Boloji.com reader, you would have seen many of my cartoons on the Home Page. 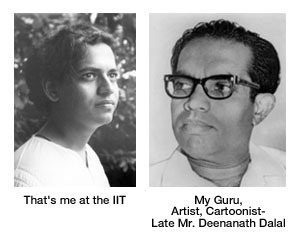 Believe it on not, I learned the art of cartooning while studying at one of the IITs. If you have the inclination, IITs can provide a very fertile ground for budding cartoonists. With so many funny guys, crazy guys and jokers around, who wouldn't get some great cartoon ideas? The funniest character I met on the campus during my years at the IIT was a watchman at the main building. There is a big well-maintained lawn in front of the main building, which provides a short cut for students between the main building and some of the engineering department buildings. Crossing the lawn was strictly prohibited (By Order!) and the watchman was very serious about doing his duty. He would patiently watch students crossing the lawn from the other corner, stop them at the corner where he was posted and send them back, again crossing the lawn all the way back to the corner from where they came. He was a great believer in discipline. Another great believer in discipline, a professor who was also the hostel warden one year, strictly followed the rules on vacating the rooms in the summer vacation and broke open almost all the rooms that students had locked and gone on vacation. There was great chaos when the institute opened for the next semester and we returned to our rooms to find all the locks broken and rooms empty. Everything from all the rooms was removed and dumped into the corner rooms in a big mess. While sorting out our own belongings from that dump, we found out many secret assets of our neighbors. Then there was this funny guy in our hostel who went to the class in a baniyan and pajamas to win 20 bucks (Indian Rupees, not Dollars!). Another character used to roam around in the hostel at night wearing only a white kurta. Those who couldn't stand this scene were requested to kindly stay inside their respective rooms. If you want to list out all the funny guys in the hostels, it would be a much longer list than the 'Roll of Honor' at each hostel. The roll of honor reminds me of two boys with innocent baby faces. We found it very funny to have such baby faces at the age of 20. Now, of course, approaching 60 myself I feel it's ok because now I think 20 year old boys are just small babies. Both these baby faces reached the top posts in their companies later in life. I don't exactly recollect, but I must have drawn the caricatures of their faces for the hostel magazine. I used to be the chief (and sole) cartoonist of the hostel magazine and got to practice the art of caricature drawing for a long time. My reference used to be the I-Card photos and if you know how funny the I-Card photos used to be those days, you can imagine how easy it would have been to draw caricatures based on those photos. We also had budding union leaders who tried their hand at forming a mess servants’ union and even arranged to force a short lived strike of the mess servants. They were called Commies but were quite friendly otherwise. Some of them did give up shaving and bathing just to build a brand image. One guy later became a full time activist. Two of them got into social work for a few years, got married, got back into engineering and management and made big bucks. Crazy guys. Even I had the crazy idea of influencing national politics through my cartoons and started practicing my art of political cartooning on the hostel notice board. One of these cartoons became quite popular and the editor of the institute news magazine quietly removed it from the notice board and published it in the next issue of the magazine (without my permission). When I saw that cartoon in print I was happy for a moment. Then I got very angry and had my first fight against 'Copyright Violation' with the editor. He became quite friendly with me in the later years and I supplied him with cartoons and caricatures for the institute magazine. 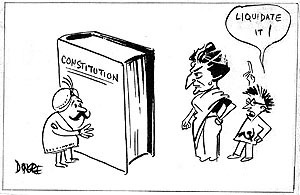 During Indira Gandhi's Emergency Rule, I really tried hard to make my voice heard in the national press through cartoons while still studying at the institute. 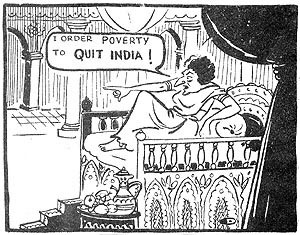 I did succeed in getting my cartoons published regularly in two weekly magazines published from Delhi. One of them was forced to close down by the Government and the other one lost its relevance after the Emergency Rule ended. Towards the end of my last year at the IIT, one of my professors predicted that if I didn't take things seriously, I would be earning not more than 400 rupees a month. Though he was not accurate about the figure, he did prove to be right about the point he wanted to make and the IIT lost an opportunity to produce one more billionaire!